360° Preview programmes are designed for use on web-sites and stand-alone viewing using the URL link to our file servers. So they can be viewed on P.C’s, Tablets and Smartphones. Plus you can view them on Google Cardboard viewers. Our programmes are all Google Cardboard enabled and so viewing moves up a gear to virtual reality when viewed through the viewer. As we are Google Street View Trusted photographers then we can convert our programme for use on Google Maps. 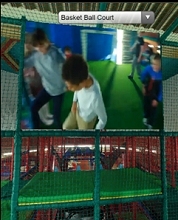 Our programmers can also convert the 360° programme into a YouTube video. The programme can be viewed anywhere in the world because it is delivered through the Internet. For a few pounds you can turn the 360° virtual tour into a virtual reality experience navigating around the tour without touching a thing. When you are viewing the screen images through cardboard you see cross hairs which you aim at the hotspots to go on the tour. 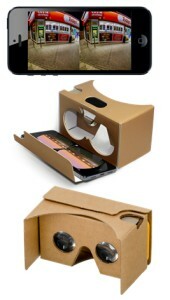 Google cardboard viewers can be branded and despatched safely as they come with a tough outer sleeve. With many suppliers of the unit an elasticated head band is provided for the ultimate ease of use and enjoyment. 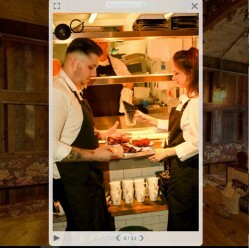 To guide you through the virtual tour we insert hotspots with descriptions of the next scene when you hover over them. Click on them and round you go. We can insert as many hotspots as the tour requires to enhance the VR experience... and in different designs. When you need to get to a point in the tour quickly you simply click on the dropdown navigation box at the head of the picture and go straight to predetermined areas in the tour. This is a great feature to review specific areas. Unique to 360° Preview is the facility to incorporate information points in the virtual tour. 360° Preview can overlay music and or voice overs throughout the tour. 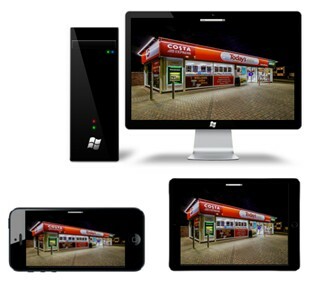 This is particularly effective when the tour is viewed on PC’s tablets or smartphones. 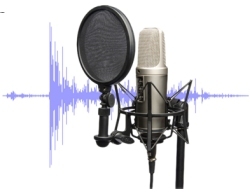 We can provide rights free music and voice over artists to enhance the ‘total’ 360° experience. Within a 360° Preview VT we can now embed videos in key areas. This gives the subject of the VT personality – and helps define the ethos and tone of a business. We can also link predetermined areas of the 360° VT to YouTube videos to expand upon a particular facet of a business. You will see later that we can also convert our 360° VT’s into YouTube videos. A great 'Can Do' that we have developed is an embedded photo slide show . In this demonstration we have incorporated slides of customers enjoying themselves – creating the ambience, shots of typical meals available and the staff serving... and enjoying the moment. This feature has endless possibilities from using as a Health & Safety test – right and wrong photos through to featuring special offers. You could introduce your team to inject further interest and information into a 360°... and we can update them remotely. Macro to Micro... size is not an issue! For once size is really not important. As we use hi-quality Fish Eye lens for the tour photography we take on board everything you can see around you. 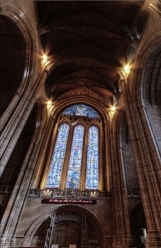 To prove it to ourselves we produced a 360° Virtual tour of Liverpool Cathedral which is the longest Cathedral in the World, the fifth largest and at 331 feet high it is also one of the worlds tallest non-spired church buildings. Check this tour for yourself and see the hi-res definition of the photography in one of the worlds largest Cathedrals. 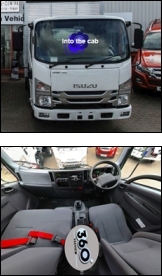 Putting a prospect lorry purchaser in the 'driving seat’ was our objective when we took on the challenge of producing a 360° VT of the inside of an ISUZU truck... which is not very big. This requires precision photography to ensure that when the shots are stitched together …you can’t see the joins. The cab interior experience has been very well received and having included this in the dealers Google Map entry exponentially increased their views. 360° VT was first seen on Google Maps and Google Street View borne of the infamous drive by videos created by Google with peoples faces and car registrations in clear view. Having rectified this the ‘drive by’s ‘are not inspiring. As Google Street View Trusted photographers we are enabled to convert our 360° programmes to be Google compatible. The results, where these have been uploaded to Google Maps, are exponential increases in the viewings. 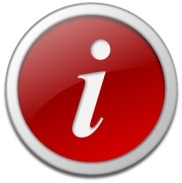 To see these please contact us so we can send up-to-date viewings on sites we have access to. 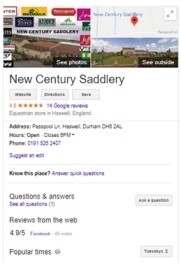 Check out New Century Saddlery and view the 360° Virtual tour of this equestrian specialist built into their Google Maps entry. With the latest developments from Google exciting, new possibilities and insights are now available. 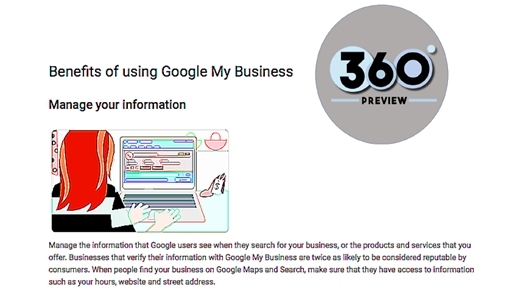 The new My Business offer from Google is fantastic and allows you to post offers, enable a direct link to your web-site whilst also delivering some amazing insights about your business and your competitors. To get a taste for these new developments download the Google ‘My Business’ presentation which with our ‘Trusted’ status allows us to implement these features for you. Click on the image, right, to see our Google My Business explained pdf.